Hello there! I am excited to be here today, hopping along with some super sweet ladies, showcasing an adorably fun set from Neat and Tangled. If you are following along with the hop, you should have come here from Heather's blog. I am sure she has something amazing made up for today! I stamped the globe image first on the center of the white card stock. Then I masked the sentiment and stamped it in 2 places. 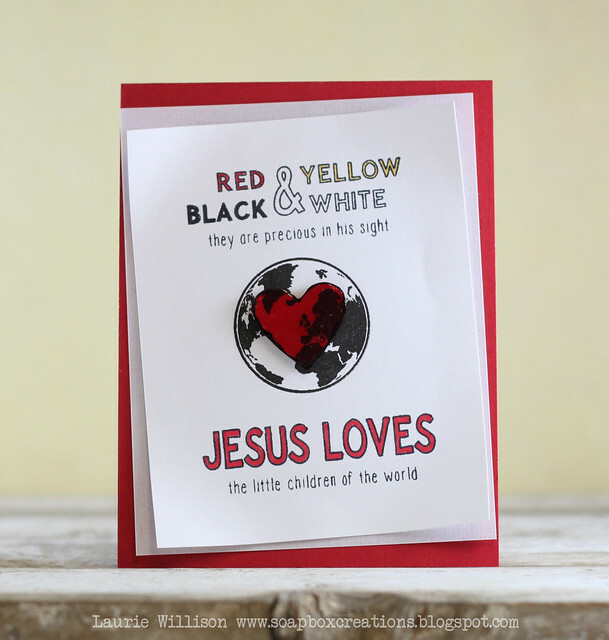 I stamped the world image again on red card stock and then stamped the heart on top of that. I cut it out and covered it in glossy accents and popped ip up on the first image, making sure the countries lined up perfectly. I colored in a few of the words with the coordinating copics. I matted the card front on a piece of vellum and then attached them both to the card front. I curled the edges of the layers with my fingers to finish it off. Your next stop on the hop is the sweet, Virginia Lu! I can't wait to see what everyone created for today, so I am going to be hopping along with you. 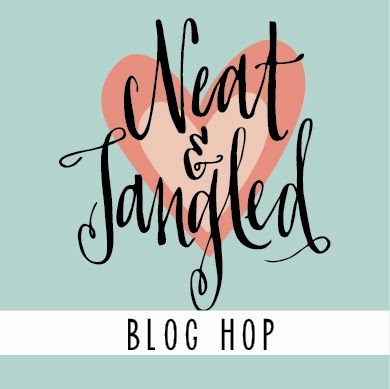 Stop over to the Neat and Tangled blog to see all the details, but there are prizes if you comment along the way. The winners will be announced on July 5th over at the NAT blog. 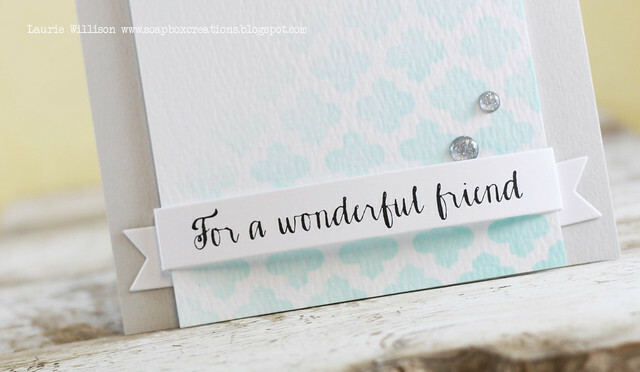 If you follow my blog, you know I LOVE new, fun fonts. 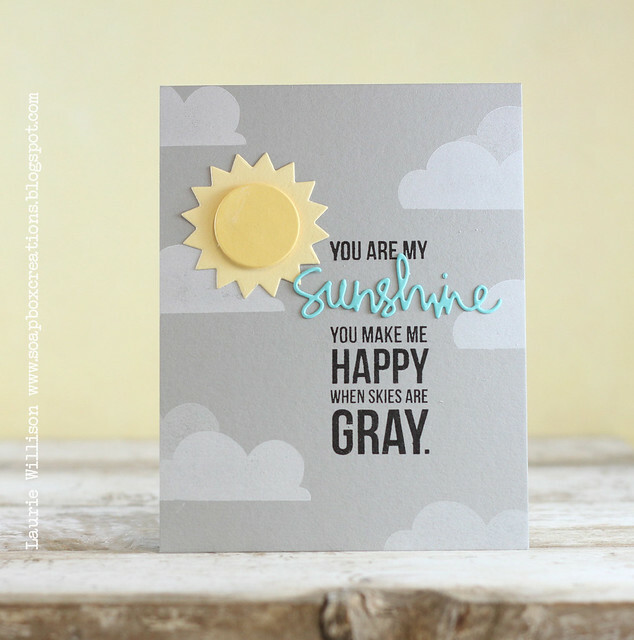 Simon Says had a stamped set in one of their latest releases called Summer Garden. When I saw it, I instantly fell in love with the sentiments. 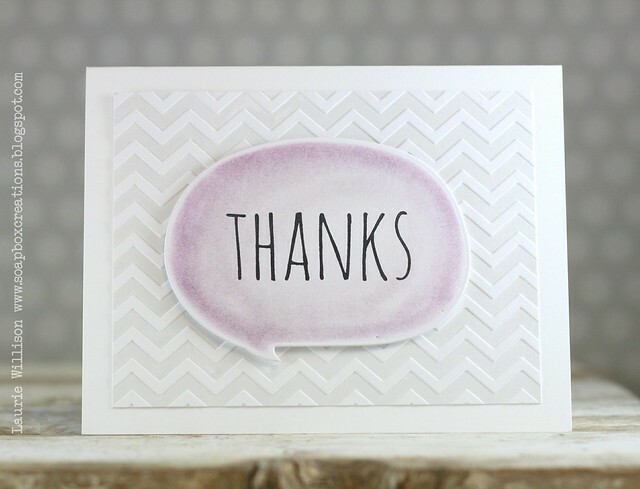 I went straight to Heidi and said....can I please have a sentiment set with this amazing font? I was SO so happy when she asked for some sentiments to include in the set. When I saw the set finished....my jaw dropped. It is a must have people. The images is so amazing it looks like it was truly pinned by hand! Life has been so busy lately that I haven't had a lot of time to play with this gorgeous new set, so I am happy that I got to use it today! First, I used the Large Moraccan stencil and some Sea Glass ink. I intended to do some water coloring so I used this Tim Holtz Watercolor paper but ended up just doing a little distress inking. I love the texture of that paper. I got a little creative with the folded banner die and made the front panel a little longer. I lined it up on a plate in the Vagabond and cut from both sided to extend the center. I used Versafine Black Onyx ink to stamp that amazing sentiment. *sigh* Love it!! I popped the front panel up on foam tape and added in some Silver Sprinkles to finish off the card. And that's it! Hope you have all had a great week! 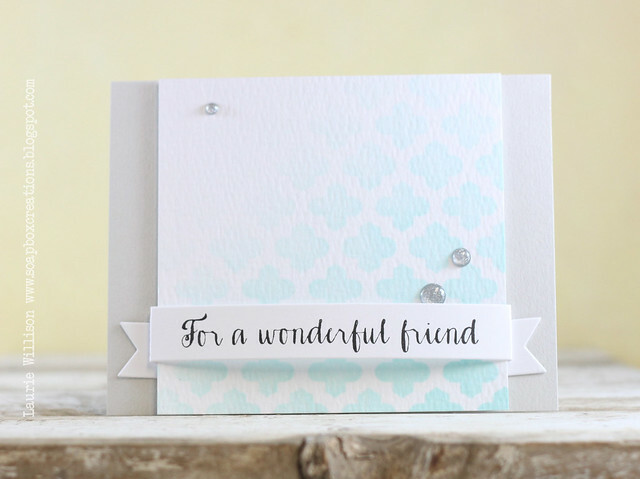 I wanted to let you know too....over on my Facebook page, I am going to give away a Card Hanger Die when I get to 500 likes. Almost there! Leave a comment over there on the Soapbox Creations page and let me know what your favorite card hanger die is. 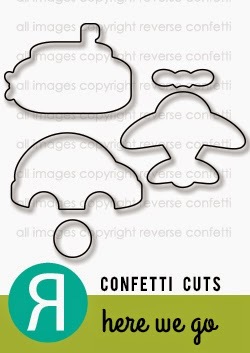 I have another order of dies coming in soon and also.....a new one! Stay tuned! Hugs! Stoppin in with a super quick card today. I haven't been home again and have missed my craft room and crafty friends like crazy! I need to catch up with the blogging world here soon and see whats new! We've been in KC at Great Wolf Lodge with the kiddos. We had a great time but I think I am all traveled out for awhile. 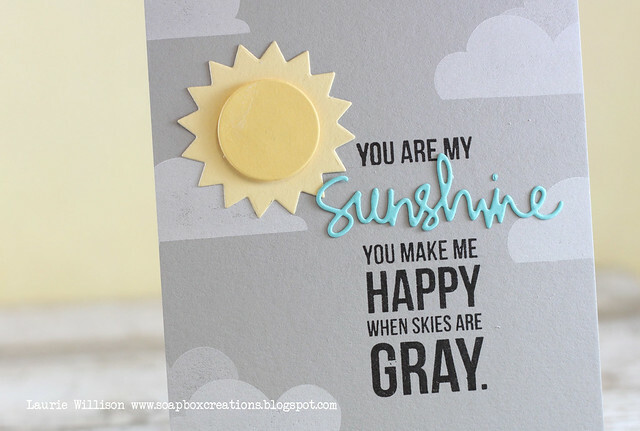 I kept it simple by adding in a chalked up bubble die from Simon Says , and then adding in a sentiment from the coordinating stamp set, Thought Bubbles. (Links below) Easy peasy! Hope your summer is going well! I can't believe we are at the end of June already! We will be back to school before we know it. Thanks for stopping in! Have a great week! 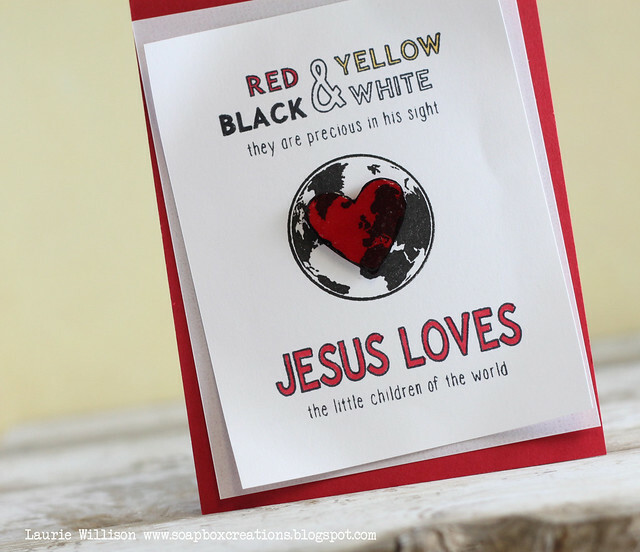 I layered the color combo in the back adhering down to the card and then added in all the details. 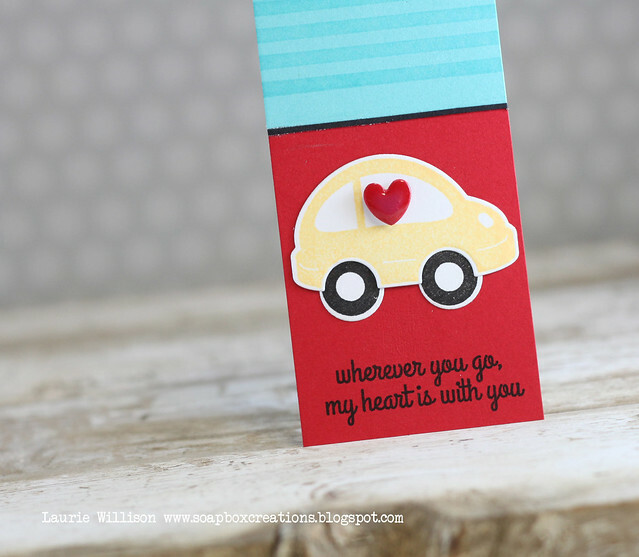 I used So Stripey on the blue panel and then I stamped the little car and sentiment from Here we Go. Isn't that car adorable? There are the most perfect dies for this set too, called Here we Go dies. I cut out a heart from the Love Note dies and popped it up on foam tape and then added in some Glossy Accents for a little shine. 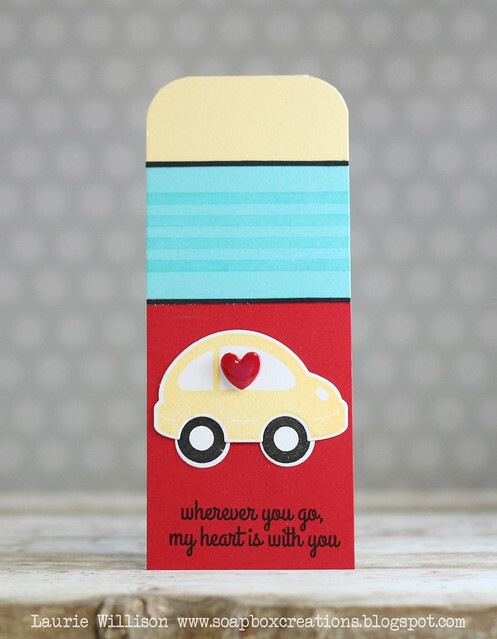 The card is 2" x 5 1/2". 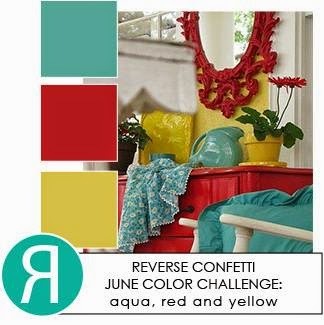 Stop by the Reverse Confetti blog to see what the rest of the team has made up for today. Thanks so much for stopping in today! I hope you have a great Monday!